I love Greek food, but if you had asked me 2 weeks ago if I liked Greek food, I would have said not really, I mean dolmades, souvlaki, sickly sweet baklava, that is what I had in my head about greek food, so I thought, it's a bit boring really. Well was I wrong. Greek food I have found out is amazing. Since starting my Eating Around the World adventure I have dedicated a month to Greece, this is the first country in six weeks that I decided to turn a week into a month, why, there is just so much food I want to make that I just can't fit it into a week. Now this dessert, what can I say about this dessert, this is delicious. Perfect custard, with a hint of citrus, wrapped in filo and baked to produce a dessert that for me is perfect. I love this and I will add, my non dessert eating husband loves this. 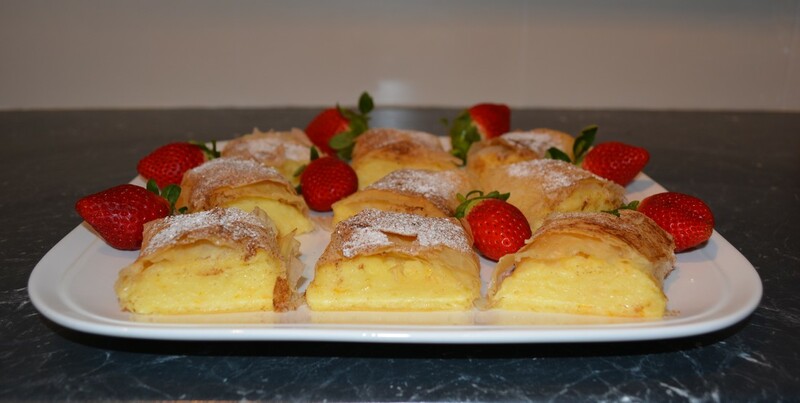 It is one of those desserts where you can make the custard in advance, just keep refrigerated until needed, then just assemble the dessert, just before you need to bake it. Eat it warm or at room temperature, just eat it. This is a dessert you have to make. Preheat the oven to 180C/160C fan forced. Lightly grease two baking trays and line with baking paper. In a mixing bowl, beat the eggs and caster sugar for a few minutes using an electric mixer. Add the lemon juice, orange zest, semolina and milk, and stir to combine. Pour the mixture into a deep saucepan and place over low heat. Stir constantly until the mixture is thick (about 15 minutes), then add the melted butter and mix to combine. (You can now place plastic wrap on the custard, so the plastic is touching the custard, and refrigerate until needed). Cut the filo pastry sheets in half and brush 2 sheets with butter, place on top of each other. Place 4 tablespoons of the custard mixture in the centre of the pastry. Fold the top over the custard, then roll up, folding in the edges to form a parcel. Continue making parcels until all the custard has been use up. Place the parcels, seam side down, on the trays and brush the tops with butter. Bake in the oven for 25-30 minutes. ​Allow the parcels to cool, then dust with cinnamon and icing sugar.